My thesis was titled Doing It by The Book: The Uses of Paratext in Creating Expectation and Determining Structural Genre in Contemporary British Fiction. As is traditional for a creative-practice thesis, it was split into two parts on a roughly 30:70 formula. The first part was a critical essay exploring the relationships between author, publisher, technology and markets. The second part was a book-length hybrid between a collection of interlinked short stories and a novel, called Steal This Book. Scarlett Thomas and Prof. Sean O’Brien were my viva examiners back in May and said kind things about my writing in their Joint Report such as ‘The book is crisply and economically written, with a vein of dark humour’ and ‘Steal This Book is clearly publishable, combining strong formal interest with readability’. 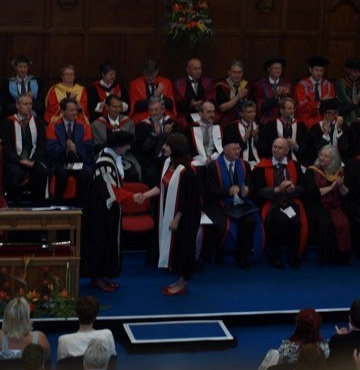 As you can see in the picture, I attended this summer’s congregations, making sure to co-ordinate my dress and shoes with the red lining of the PhD gown.